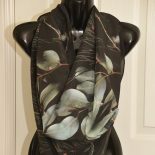 This gorgeous crepe de chine silk scarf is currently on view at Finders Keepers cafe, Mitchell Street, Bendigo. It measures one metre square and features the native eucalyptus and sheoak of the region. It is for sale, $150. You can buy it and take it home with you on the same day! This entry was posted on November 19, 2018 by sharongreenaway in #sharongreenaway and tagged art, australian, bendigo, cafe, exhibition, finders keepers Bendigo, flora, photography, Sharon Greenaway, sharongreenaway.